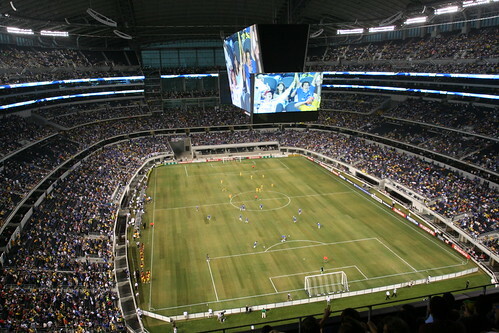 I attended Sunday's match between Chelsea FC and Club America at the new Cowboys Stadium, the $1.15 billion facility that opened a few weeks ago in Arlington. I expected the stadium to be huge, but Dallas Cowboys owner Jerry Jones has managed to construct a facility that is enormous even by the overcompensating standards of big-boot, tiny-johnson Texas excess. Cowboys Stadium has the largest roof in the world that isn't supported by columns. Two arches twice as wide as the Gateway Arch in St. Louis support the roof, which is tall enough to hold the Statue of Liberty inside. The facility also has the world's largest retractable roof and the largest movable glass doors at each end zone. I don't know why these doors are needed, unless the facility is hoping to schedule meetings of the Transformers. 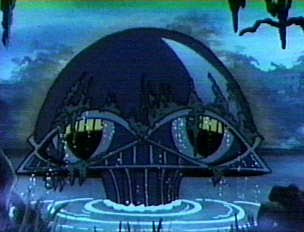 From the outside, the stadium looks like a cross between the Legion of Doom headquarters and a Decepticon. I'm concerned that the first time the Dallas Cowboys lose a big game, the stadium will rise up in anger and reduce the Texas Rangers' ballpark next door to rubble. During the match a massive thunderstorm raged outside, with lightning striking so close that fans gasped. Under the closed roof, you couldn't even tell the storm was bad. The stadium is larger than nature. Inside, the view is great even from the upper deck cheap seats, which is where I sat, and the whole place is air conditioned. As the crowd of 57,000 filled out -- the stadium holds 82,000 -- blasts of cool air on my back kept the place comfortable. The carbon footprint can't be pretty. I'm guessing that every day this facility operates, the Earth's lifespan is shortened by a day. This is a fair trade. The most amazing feature of the stadium is the world's largest HDTV, which hangs from the ceiling and faces both sidelines. Smaller side TVs hang off the sides. The TV deserves its own name, so I've been calling it Telemanjaro. Telemanjaro is 160 feet wide, 72 feet tall and lit by 300 million bulbs. The picture quality is flawless. From the upper deck, Telemanjaro occupies up so much of the view that you cannot see one-fourth of the fans in the stadium. It's tough to find a picture that conveys the enormity, but here's one by Erik Grande. Although this sounds like a knock against Telemanjaro, it's actually the best experience I've had watching a game from the uppermost deck of a large stadium. You don't miss anything from the nosebleeds. The gigantic screen sees all and knows all. Speaking of which, one of the Club America players desperately needs to exfoliate. As a child of a generation raised on television, I cannot help but regard Telemanjaro as the pinnacle of human achievement. I felt a strong compulsion to worship Telemanjaro and to buy the products it advertised to stay in its favor. Anyone who visits Dallas should make a pilgrimage to see Telemanjaro, no matter how many organs you must sell to afford Jerry's ticket prices. Fun fact: As much as two-thirds of your liver can grow back if removed. The TV hangs above the players and weighs 660 tons, which initially made me fear that an accident might crush more than a dozen pampered millionaires to a fine paste. But I realized quickly that Telemanjaro loves us and would not harm us, as long as we keep watching. And what about the old hole in the roof, which everyone knows was put in the old stadium so God could watch His team play. Does God have his own private feed to Telemanjaro now? The new roof can be retracted so God can watch the game, weather permitting. The stadium is larger than nature. Now there's some hubris that can be looked up and quoted sometime in the future. Unsinkable indeed. Already 86 hits on teh Google for Telemanjaro, Rogers. This one might stick. I cannot tell you the last time I've laughed this much while reading an "article". Great work. "As a child of a generation raised on television, I cannot help but regard Telemanjaro as the pinnacle of human achievement." Janet Jackson had a wardrobe malfunction when I read that sentence. Thank you sir. That is one HUGE television I only wish to be able to play the Playstation on a t.v. that big one day! I am from Texas and a little concerned as to your fettish regarding size. The HDTV, the stadium itself and the most disturbing, men in Texas penises. The stadium was built to this size to host a Superbowl. The stadium actually holds 82,000 and is expandable to hold 100,000. The HDTV is actually 160ft.X 72ft. (11,520 sq. feet). This stadium will host Super Bowl XLV in 2011, beating out bids from the University of Phoenix Stadium in Glendale, Arizona and Lucas Oil Stadium in Indianapolis, Indiana. It will also host the 2009 Big XII Football Championship and Cotton Bowl, the 2010 NBA All-Star Game and the 2014 men's Final Four. Can't wait to see the Packers take a win in their first appearance in that big, 1.15-billion dollar facility! Go Packers! During last night's Tennessee-Dallas game, a Titans punter actually hit Dallas's massive 180-foot-long HD screen, creating a bit of a situation: The play isn't reviewable, and there's no provision for a replay. The solution may cost millions of dollars.